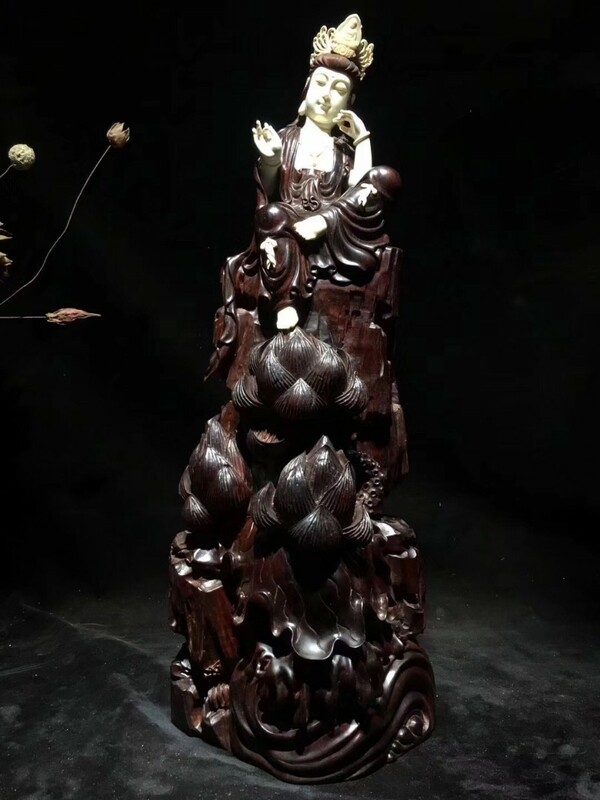 Feature：“ Avalokiteśvara Sits on the Lotus”(1*) , handmade, wood carving (2*), Zitan - Pterocarpus santalinus(3*), and 10,000 years of mammoth ivory. Size 18x16x53cm, weight 5200g. 1* Avalokiteśvara is a bodhisattva who embodies the compassion of all Buddhas. 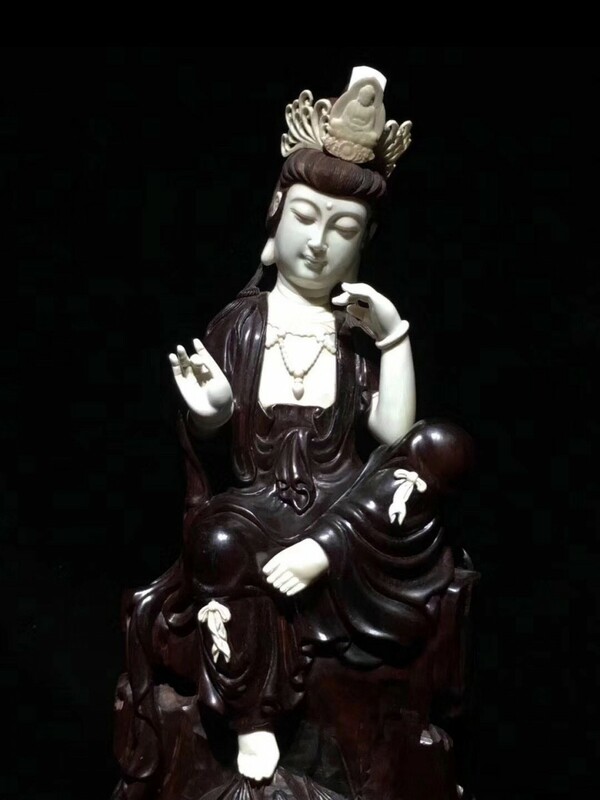 This bodhisattva is variably depicted and described and is portrayed in different cultures as either female or male. The name Avalokiteśvara combines the verbal prefix ava "down", lokita, a past participle of the verb lok "to notice, behold, observe", here used in an active sense; and finally īśvara, "lord", "ruler", "sovereign" or "master". In accordance with sandhi (Sanskrit rules of sound combination), a+iśvara becomes eśvara. Combined, the parts mean "lord who gazes down (at the world)". In Sanskrit, Avalokiteśvara is also referred to as Padmapāni ("Holder of the Lotus") or Lokeśvara ("Lord of the World"). 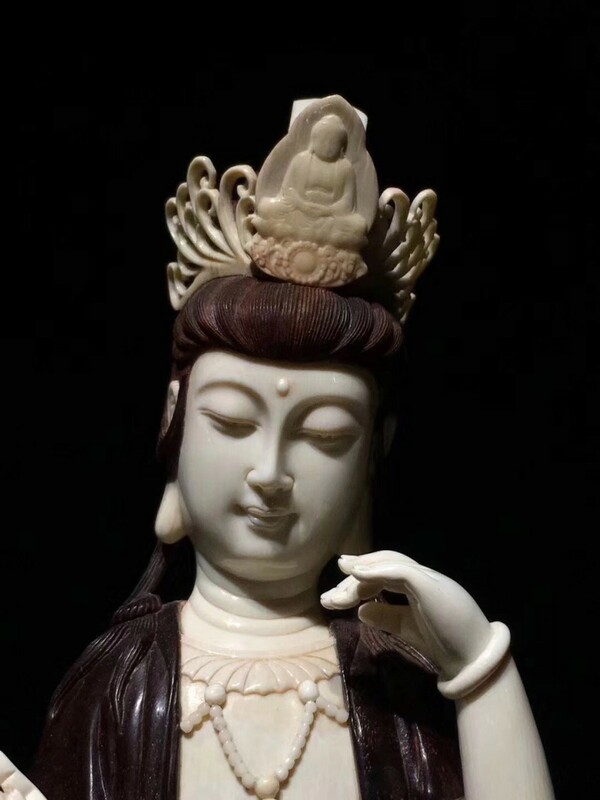 According to Mahāyāna doctrine, Avalokiteśvara is the bodhisattva who has made a great vow to assist sentient beings in times of difficulty and to postpone his own buddhahood until he has assisted every sentient being in achieving emancipation. 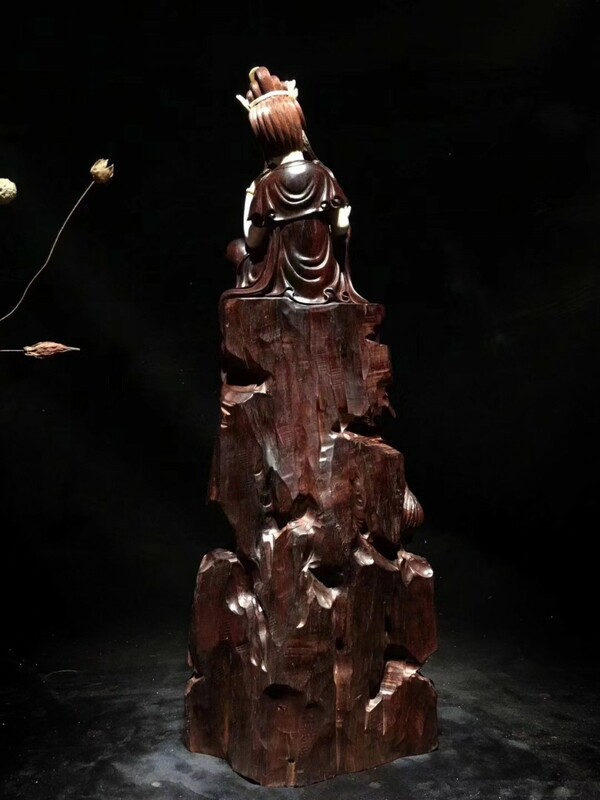 2* The making of sculpture in wood has been extremely widely practiced but survives much less well than the other main materials such as stone and bronze, as it is vulnerable to decay, insect damage, and fire. It therefore forms an important hidden element in the art history of many cultures. Outdoor wood sculptures do not last long in most parts of the world, so that we have little idea how the totem pole tradition developed. 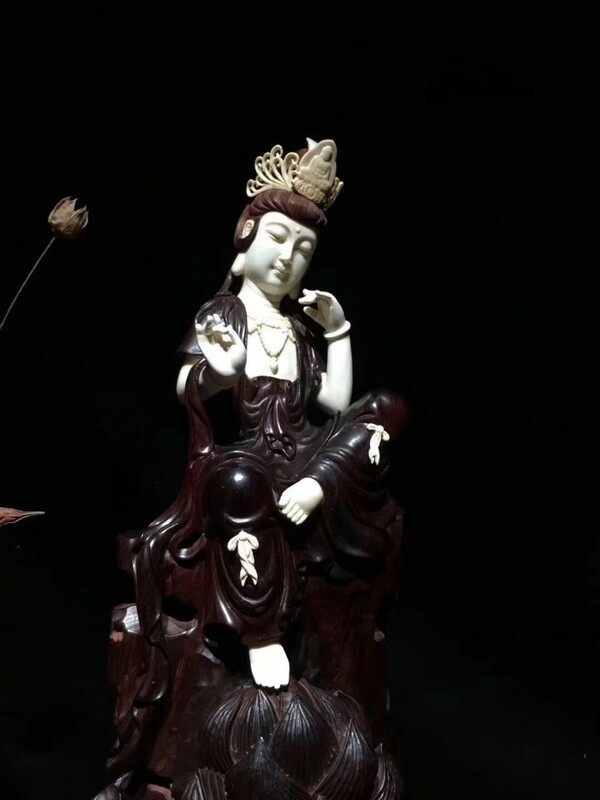 Many of the most important sculptures of China and Japan in particular are in wood, and the great majority of African sculpture and that of Oceania and other regions. Wood is light and can take very fine detail so it is highly suitable for masks and other sculpture intended to be worn or carried. Some of the finest extant examples of early European wood carving are from the Middle Ages in Germany, Russia, Italy and France, where the typical themes of that era were Christian iconography. In England, many complete examples remain from the 16th and 17th century, where oak was the preferred medium. The type of wood is important. Hardwoods are more difficult to shape but have greater luster and longevity. Softer woods may be easier to carve but are more prone to damage. Any wood can be carved but they all have different qualities and characteristics. 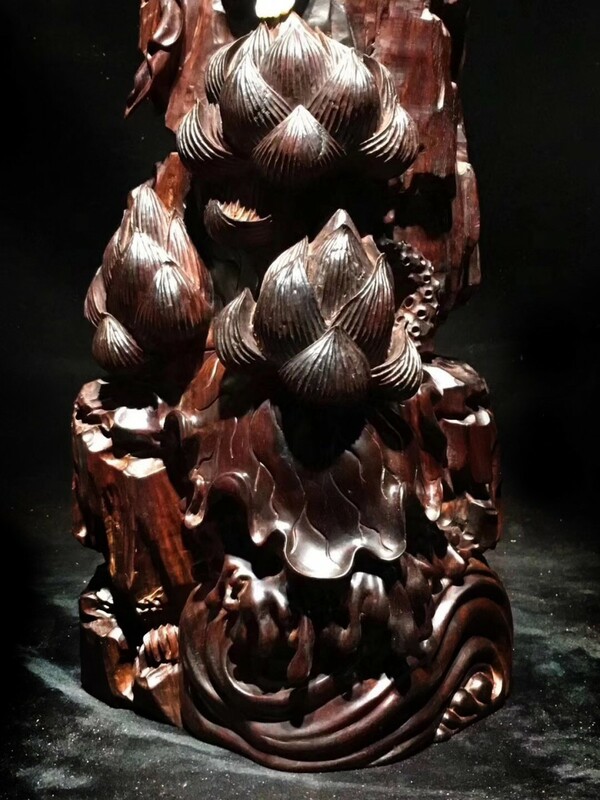 3* The wood has historically been valued in China, particularly during the Qing Dynasty periods, and is referred to in Chinese as zitan and spelt tzu-t'an by earlier western authors such as Gustav Ecke, who introduced classical Chinese hardwood furniture to the west. An exquisite chair made of red sandalwood can be seen today in China's Forbidden City in Beijing, inside the Hall of Supreme Harmony, and once used by the emperors of the Qing Dynasty. Due to its slow growth and rarity, furniture made from zitan is difficult to find and can be expensive. It has been one of the most prized woods for millennia. Pterocarpus santalinus, with the common names red sanders, red sandalwood, and saunderswood, is a species of Pterocarpus endemic to the southern Eastern Ghats mountain range of South India. Pterocarpus santalinus is listed as an Endangered species by the IUCN, because of overexploitation for its timber in South India. It is also listed in the appendix II of the CITES, which means that a certificate is required in order to export it, that should only be granted if the trade is not detrimental to the survival of the species.